Surprise! More pizza! Today is deep dish and doesn't it look really, really good? Well, it is. The perfect crust, sauce, cheese, and topping combo. Amazing, simply amazing and amazingly simple to make at home. C'mon . . . you know you want to try it. In a mixing bowl, add water, yeast and sugar and stir to blend. Add the corn oil and blend. Add 2 c. of the flour and salt and mix thoroughly. Sprinkle additional 1/2 c. flour on a flat surface and knead dough for about 5 mins., incorporating the flour as needed. When dough is smooth, shape into a ball. Coat a large bowl with a little olive oil. Place the dough ball into the bowl and turn it twice to coat it with the oil. Cover the bowl with plastic wrap and a kitchen towel. Let the dough rise for two hours. Place the dough ball into an oiled deep-dish pizza pan and press to cover the bottom and up the sides of the pan. Note – Once the dough ball is placed in the oiled bowl, it can be refrigerated to rise overnight. Remove from the refrigerator one hour before assembling pizza. Heat oven to 475 degrees. Blot any excess water from the tomatoes with a paper towel and stir in Italian seasoning and garlic powder; set aside. Layer the mozzarella slices to cover the dough in the bottom of the pan. Oil two pieces of foil and place sausage between them. Roll with a rolling pin to flatten into a thin disk (1/8 inch thick) the size of the pan. Peel off one piece of foil and place sausage over the mozzarella slices. Carefully remove second piece of foil. Sprinkle pepperoni pieces over sausage. Next, spread tomatoes over sausage. Finally, sprinkle Parmesan and Italian cheese over tomatoes. Place pizza in oven and bake until crust is brown and cheeses are just beginning to brown. Let pizza cool for 5 minutes before slicing and serving. The pan I used for this pizza is heavy and has holes in the bottom. When I place this pan on my pizza stone, the crust cooks evenly and is nicely browned and crisped - strong enough to support the toppings, if you want to eat it out of hand. Most deep dish pizza pans I find online do not have holes, but they will do a fine job with the crust, especially if baked on a stone. Of course, if you have a cast iron skillet hanging around the house, it will do quite nicely for baking a deep dish pizza. Use a well-seasoned skillet and coat it with olive oil and you will have a crisp, golden doughy crust. 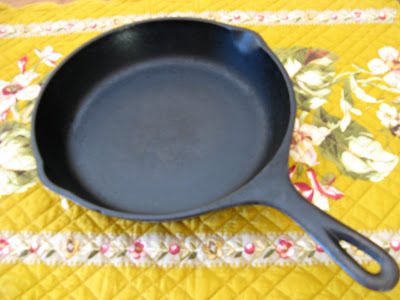 Of course, the advantage to using a cast iron skillet is having a handle to . . . well . . . handle the pizza going in and out of the oven. This looks great! I am a thin crust girl at heart but I've been dying to use my cast iron skillet to bake a pizza! Thanks for the ideas.